2.0 out of 5 starsDid not finish. DNF. Couldn’t take the way the drunken deputy instigated a fight and the sheriff allowed it to happen. Not what I want to read. I understand this may play into the story further on but bigotry is not acceptable to me. Read for free on holiday. I received a free copy of this book and am voluntarily posting an honest review of it. Emma is the feisty sheriff of the small town of Riverwood. A group of miners have moved into the town and are causing some trouble with the locals. These miners work for a company called Eventide; but no one knows what they are digging for or just what it is that they want. Their ads claim that they are taking copper out of the soil beneath the town. Liam is a bear shifter who works for a mysterious agency called Therion and he comes to Riverwood because he found a piece of paper with the name Eventide and an address in Riverwood on a previous case. He meets Emma and recognizes that she is his mate; but she knows nothing about shifters. Holes are being dug in strange places and strange symbols are being left near them. Then a body is found and it was a friend and work mate of Liam. Emma;s brother Logan is also a bear shifter; but neither he nor Emma knew anything about it. Liam is there when Logan has his first shift and helps him through it in his grizzly shape. Emma and Liam catch up with Roscoe Hicks the wolf shifter who murdered Liam's friend; but Roscoe tells Emma that Liam has been lying to her and while she is berating Liam, Roscoe disappears. Ernie, Emma's deputy goes after Roscoe to arrest him and Roscoe almost kills Ernie. Liam goes and finds Roscoe in one of the many tunnels that have been dug under the town and Roscoe tries to kill Liam; but Emma arrives and helps Liam. Then the tunnel collapses and Liam manages to carry Emma out. Liam has also been contacted by a mysterious man names Sam who appears and disappears quickly. Who are Sam and Aleister? What do they want in Riverwood? What do the symbols mean? And what are the mysterious seals and why are they being searched for and then broken? Are they for good or evil? This is a new author to me. I enjoyed the book, but find it frustrating to wait for the answers in more books. Many shifter stories involve the search for a mate. This story is basically a murder mystery with the love bit thrown in. Not to say that it does not contain all of the emotion of a love story, just written with lots of twists and turns. A very enjoyable book to read and I highly recommend it. 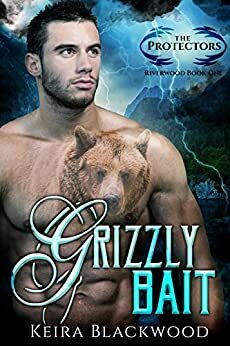 A protector grizzly bear shifter Liam goes on a new case where he meets Emma and her brother Logan (unknown to him also a grizzly bear shifter)just before his 18 birthday (a time where shifters begin to shift). Until his shift starts their mother has never told them their father was a bear shifter so Logan faces this night not knowing what is happening or how to deal with the pain,fear, or the new power and his sister who doesn't know as much as he does trying to help him. Logan knows Emma needs him, she is in fear and he knows what she is afraid of and that he is the only one who can help. But can he get there in time? It doesn't say why Emma doesn't shift or know anything about it.Though she has some ways of her own that shifter blood could explain.She is the sheriff and seems to fight as good as any man and better than most. I couldn't give this 5 stars, so I settled on 4 stars. The story line is worth reading and it's got shifters which I can't seem to get enough of, but if you're going to read it I'd advise you to purchase all 3 books in the series. Normally I don't start reading a series that's a continuation of the 1st book, but since it was given to me by the author for an honest review I thought I would give it a shot. I recommend the book if you enjoy reading about shifters, humor, mystery, small towns. Keira, you did an amazing job with this book. Emma and Liam are great together, and you've got a good mystery going. I can't wait to read the next book. Now this is what I call a good story! There is lots of anticipation between the two main characters that makes you want to read faster abd faster. There is murder and mayhem, lust and love. There is mystery and mysterious characters, in fact there is so much going on and then there is a cliffhanger! Man, i was furious 😉. So now I have to go find Book 2. She's the sheriff and he works for a secret group of shifters. Both are trying to figure what is going on with a company that is supposed to be mining copper. The will have to work together, but can they resist the attraction they have for each other? He has to keep secrets and the biggest one is that he is a werebear. A paranormal detective story with a possible romance. I voluntarily read and reviewed a copy of the book.